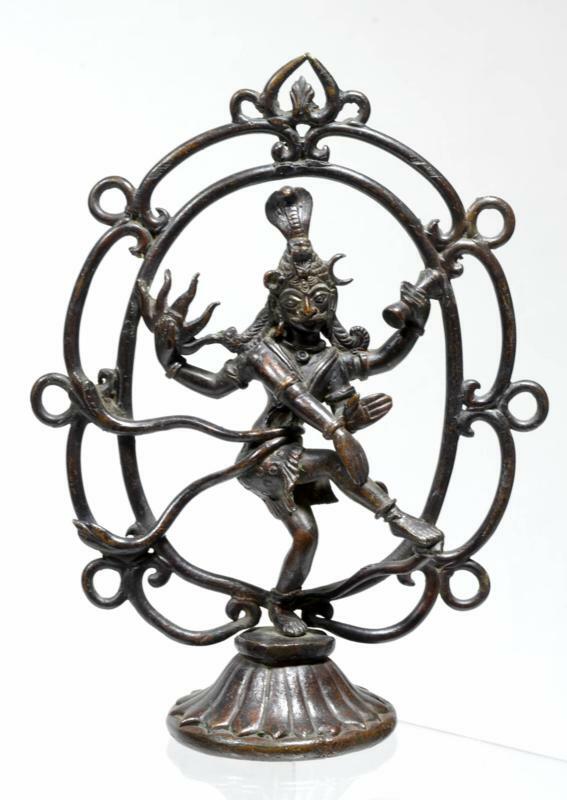 This unusual bronze of Shiva as Lord of Dance has been cast using the lost wax process. As the Lord of Dance, Nataraja, Shiva performs the tandava, the dance in which the universe is created, maintained, and ultimately, dissolved. The image stands on a conical dais cast or chiselled with lotus petals. Shiva is in conventional dance mode - balanced on his left leg with the right leg raised. He has two sets of arms. The front pair are thrust forwards for balance. But their positions also have significance. The lower right hand is in the abhaya mudra ('fearlessness') position bestowing protection from both evil and ignorance to those who follow the righteousness of dharma. The lower left hand points to his raised foot to signify upliftment and liberation. The back two hands hold attributes. One holds an unusually prominent array of flames or fire (agni) to signify destruction. The other holds a small hourglass shaped drum - the ?amaru in Sanskrit. Its beat symbolizes the passage of time. a luxuriant moustache. A tiger skin has been cast around his waist. Shiva's dance is believed by adherents to have occurred at the site of the Thillai Nataraja Temple at Chidambaram in Tamil Nadu. As such, the temple is an important pilgrimage site and the temple is wealthy on account of the donations it attracts. Shiva and his consort went for a stroll in a nearby forest when they ca,me across a group of sages or rishis. The sage and their wives were very impressed by the beauty of Shiva and his consort. The sages were upset when seeing their wives so enchanted and so invoked the presence of serpents (nagas) through magical spells. Shiva reacted by lifting the serpents up and festooning his hair and body with them. This annoyed the sages more so they invoked the presence of a tiger but Shiva used its skin as a cloth that he wrapped around his waist. The sages then invoked a powerful demon Muyalakan, a symbol of arrogance and ignorance. Shiva responded by dancing on the demon's back, at which point the sages gave up, realising that they must now be in the presence of a god and the way of truth. The figure has a dark, varying patina, and is in fine condition. The image is unorthodox, sculptural and dynamic.